Well, I done did it. If you are looking for race advice just scroll to the bottom of this post. I have wanted to do this race since about 2007 when a couple friends of mine did the race. I hadn’t ever ridden a mountain bike for more than about, say, 40 miles in a day before. I just hadn’t ever done it. I’ve ridden centuries on a road bike but endurance rides on trail was just something I hadn’t pursued. This race was in the very far corners of my mind and wasn’t a goal I had any sort of timeline for. It’s amazing what peer pressure can do. As of today, I’ve lived in Richmond, VA for two weeks. My new boss (Joey) signed up for and began training for this race months ago. Despite the hefty entry fee, I allowed myself to succumb and signed up three days before the race. Tip #1 for the race- train beforehand. Elevation Profile. The big climb is known as the “soul crusher”. If it was easy, then everybody would do it. This year, we dealt with the aftermath of hurricane Issac during the race and it was wet and slick and muddy and I’ve never eaten so much dirt in my life. I don’t have many good photos (to make this post interesting) but I’ll try to give a general run through for anyone interested in riding the race themselves. Our crew (3 riders and 2 lovely support crew) left Richmond late on Saturday. Two beer stops and as many pee stops later we got to the campground well after dark and after the dinner that is provided to riders on Saturday. Since we missed dinner we proceeded to drink for sustenance and have entirely too much fun while the rest of the campground was pretending to sleep. Race tip #2- go light on the beer and whiskey the night before the race. I have always had a bit of insomnia and have spent sleepless nights before races and this one was pretty bad. My experiences have taught me how to perform well on no sleep but I have no suggestions for you folks with the same problem other that try out some sleep aids well in advance of your race (simulating early wake up/workout) and see if that works for you. I just lay as still and relaxed as possible and that can be as close to sleep as I can get sometimes. So, after many hours of just laying there waiting it was time to get going. At 5am someone rides around the campground beating the finish line gong and the place explodes (the port o johns explode too). I stuffed my face with a bagel and cream cheese, a power bar, salty scalloped potatoes, and coffee. I was extra generous with the chamois butter (the only piece of advice to come from my father when he learned I was racing), grabbed my prepared camelbak and headed to the start line with Team Lone Wolf No Team. The start is divided by expected finish times and we tucked into the 10 hour crowd. The gun went off and I heard one of my favorite sounds-the start of a bike race. Be very cautious if you do this race because a bunch of mountain bikers get nervous riding in a peloton. A quick jaunt on pavement and you start the first climb on double track. I lost track of one of my buddies right off the bat and rode with Joey and another friend we met up with for the race. I didn’t have a race plan other than don’t go out too hard for the first 25 miles and eat plentifully. Trying to keep up with Joey on his singlespeed was destroying my race plan, so I said goodbye to them and throttled back on the climb. I was riding solo, along with hundreds of other bikers. When we finally hit singletrack, it was a serious goat show. There are so many riders jammed in there it’s easy for one person to blow a line and everyone has to put a foot down. Also, it seemed like there were plenty of folks that were aerobically fit but lacked technical riding skills. Just be ready for it. My noble steed. Poor thing never saw it coming. After an hour and a half or so I caught back up with Joey and we had some fun riding together for another 1/2 hour on what I think they call the “death climb”. I would’ve been difficult if there weren’t hundreds of racers but since there was it was lots and lots of hike-a-bike. We rode into aid station 3 together, but after that began quite a climb that Joey had to climb at his own pace on (which was much faster than mine). You might notice that I use the word climb quite a bit in the report, and that’s because there is somewhere around 13,000 feet of climbing in the race. Race tip #3- be prepared for lots of climbing. 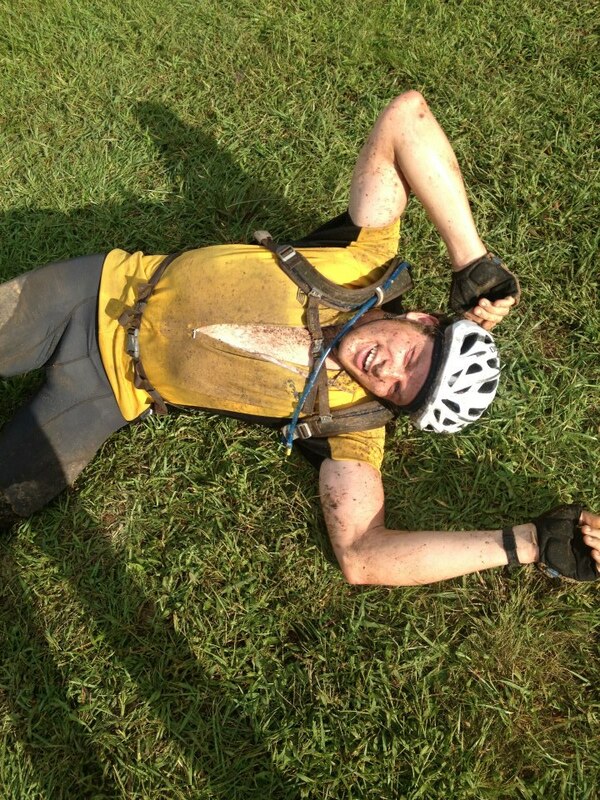 Between about 35-55 miles there was a singletrack climb that was pretty taxing. I began cramping somewhere around mile 30 and had to pull up out of that nose dive by consuming salt pills like my life depended on it. I have always struggled with cramping in endurance events and not having trained for this one my cramps were especially unfun. Luckily, they have salt pills at the aid stations and a nice rider I rode with some told me not to hold back so I ate them like a fat kid eats jelly beans. Between that and the electrolyte replacement drink (heed) at the aid stations I actually beat back my cramps and it totally saved my race. I was on my way to a leg-locked DNF and I am very pleased that did not happen. Luckily this was at the finish and not in the middle of the course. I didn’t have a bike computer, I think that would have been disheartening. I didn’t know the course that well (never ridden any of it) I just expected the worst. I did wear a watch to keep track of my eating. I tried to eat every 45 minutes on the bike and would eat all I could at the aid stations. The aid stations have lots and lots of food so if you are planning for this race get a feel for what they have and try it out on your training rides. My staples at the stations were oreo’s, fig newtons, and bananas. At the later aid stations I ate PB&Js and drake coke (the fifth one has pizza and you’d better believe I indulged). Overall I think smart eating was huge in my performance. 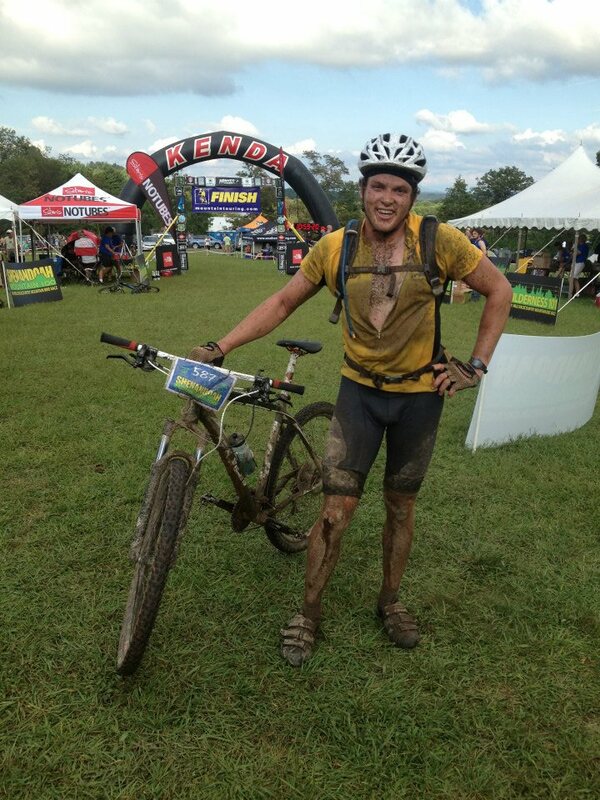 There were two massive thunderstorms during the race, and I ate and drank mud. I didn’t wear glasses and would get huge gobs of mud in my eyeballs. Every part of me and my bike was wet and slimy. Eventually (after about 6.5 hours of racing) it stopped raining altogether. That was about when I hit the big climb. The first part is all double track and not too bad of a grade, you are just a little spent at that point in your day. I climbed the best I could, which ended up being on my small chainring for the second half. The 5th aid station is NOT at the top of the climb, and I hit the pizza and coke hard and went to face the music. It took me 50 more minutes to hit the top of the biggest climb after the 5th aid station. It was the hardest part of the race. Sloppy and awful. I went down once in a giant mud puddle. You ride through about 5 high meadows before you hit the singletrack descent. When I reached the top, I paid homage to my home state of Tennessee and ate the most delicious double-decker moon pie of my life (a critical piece of my drop bag at the 5th station). My brake pads were about gone so I was a Tentative Tabitha the whole way down. It was slick and scary for the first part and I just about lost it more than once. I somehow survived and found myself at the 6th and final aid station with 12 miles to go. I never computed how far I had left in the race total, but I would ask how far it was to the next aid station when I would pass through one. When I heard there were 12 miles left, I skipped the last station and dropped the hammer down. My race plan paid off. I decided that with 50 minutes left that I could finish in less than 11 hours and wanted it real, real bad. It hurt so good. I didn’t get passed in that last section and I’m very glad I did not because I would have tried to match pace and was already at my 100%. I tried to use ole Bobby Moss for motivation and the last climb surely laid a-hurtin on me. It just never seemed to end. I reached deep into the suitcase of courage. I had begun to have chain trouble with all the mud and didn’t ever shift to my small ring for fear of dropping my chain off. That forced me to ride faster and lay on the pain train more. The clock ticked on and I was beginning to crack. I decided that I had to keep pushing until I was actually past 11 hours by my watch. That very thing saved my time. I never gave up. Finally, I saw a guy in a polo shirt and khaki shorts. After seeing disgusting racers and rain-drenched volunteers since sunup, this clean-cut dude could only mean one thing- I was painfully close. Sure enough, I starting seeing tents and then more people and knew I was right on top of the campground. I was flying. The trees opened up, there was green grass in front of me and I hit the last turn and the finish line. Just less than two minutes to spare on the clock for my impromptu goal of sub-11 hours. 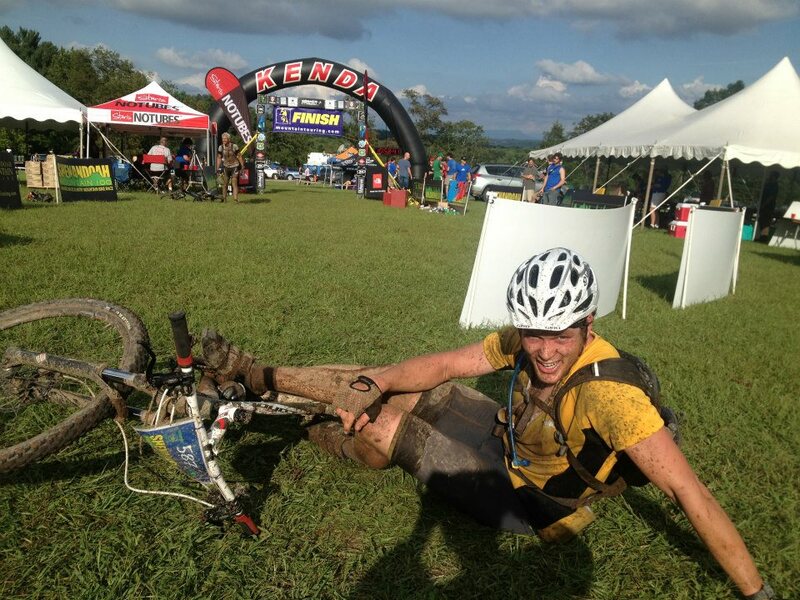 As much fun as it is to do an endurance race, it is that much more fun to cross the finish line and be done. Joey had finished 30 minutes before me, but sadly the other two members of Team Lone Wolf No Team didn’t finish. One had severe mechanical issues and the other had severe bodily issues. It’s not an easy day on the bicycle. That’s what you’ll like like too if you ride 100 miles in a hurricane. Look at that clock! Sub-11!!! It was easier to just lie down for a sec instead of celebrating. Posted in Outdoor Adventures, Uncategorized. 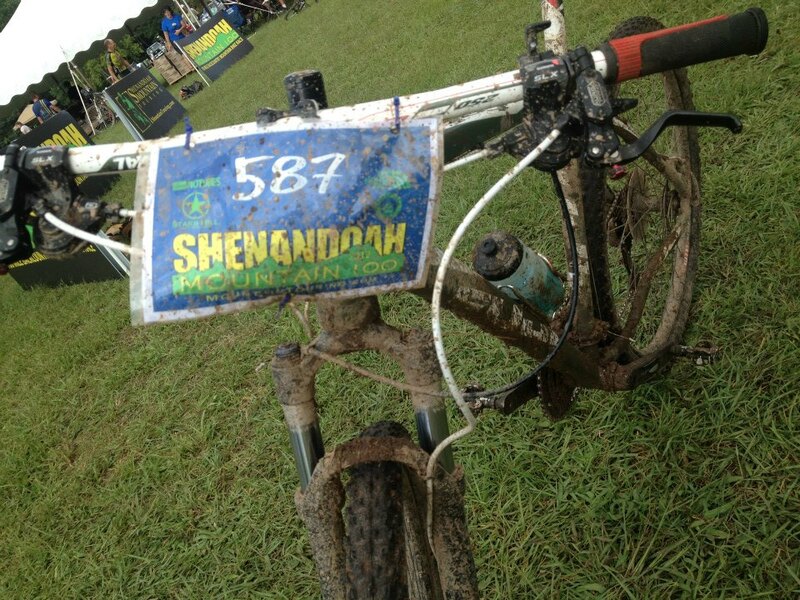 Tagged Adventure Cycling, Backountry Mountain Bike Racing, Mountain Bike Race Recap, Mountain Bike Racing, Mountain Biking, Raising the Gnar Bar, Shenandoah 100, Shenandoah 100 Advice. Previous: Previous post: what the heck is sam jordan doing? Next: Next post: Link to a bikepacking trip report! Click here!